So I’m reading the Little Engine that Could to my boys, and I notice something very suddenly: the Little Engine is female. And the two engines that refused to help the clown and toys were both male. Hmmmm…..
1. The male trains are described as new and shiny and the other as big and tough. The Little Engine is “a small engine. A very small engine, but maybe she can help us.” Only maybe? C’mon. She’s a woman, of course she can help you! And could they get more stereotypical? Me man, me big and strong. You woman, you small and weak. Sexist pig author. 2. The clown and other toys tell her the children will have nothing if she doesn’t pull the train over the mountain. Well of course! The stupid male trains wouldn’t lift a finger to get the kids fed and make sure they had age-appropriate toys, noooo, it’s assumed the woman will take care of that! 3. Added bonus: they guilt her into it. How many women are susceptible to guilt trips, especially where children are involved? Raise your hands. How many have guilted yourselves into things because of your children?! Go on, raise your hands. It’s all about the honesty here! 4. 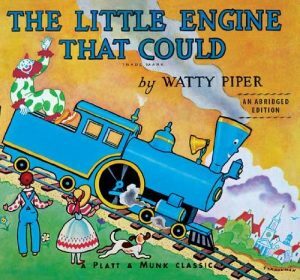 The Little Engine immediately doubts herself and lists the reasons why she can’t do the job: she’s never pulled a train before (like that matters! ), she only works at the train yard (this is a metaphor for stay at home moms!!) so she’s not sure she can help (the SAHM trying to break back into the work force no less!). Why does she have such low self-esteem I ask you? ure you can convince her to change her mind! Go! 6. She has to work very hard to get the kiddies their crap, I mean, their “toys and good food to eat,” pulling that damn train all night. You know those mean male trains aren’t workin’ all night! Does your husband give you the ol’ “but I have to get up and go to work tomorrow and you don’t” routine at 2am with a puking kid? Typical.